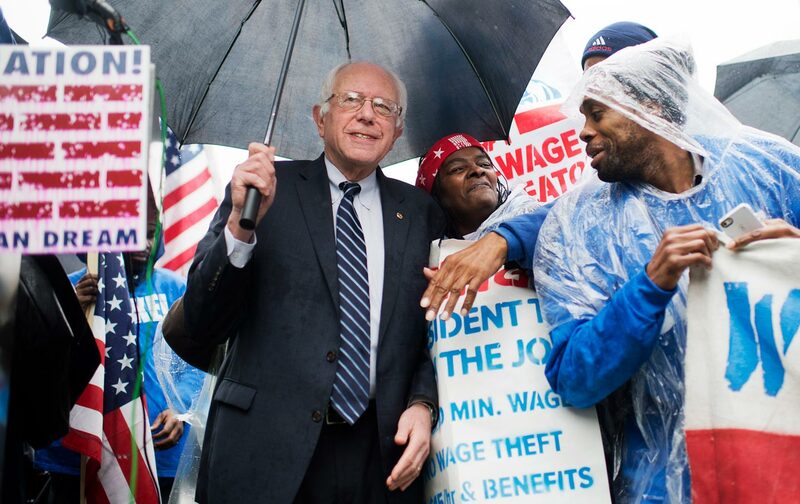 All of Sanders’s major proposals are grounded in solid economic reasoning and evidence. Barack Obama’s presidency has certainly delivered important economic policy accomplishments, despite relentless Republican opposition. These include preventing a 1930s-level Depression after the 2008–09 Wall Street crash, steadily bringing unemployment down in the aftermath of the Great Recession, greatly expanding healthcare insurance coverage through the Affordable Care Act, and promoting clean energy investments. Nevertheless, inequality has continued to rise under Obama; 33 million people still did not have health insurance at the end of 2014; greenhouse-gas emissions causing climate change have not significantly fallen; and average wages for non-supervisory workers remain below their 1973 level, despite average productivity having more than doubled over the past 40 years. Overall economic growth since Obama took office has also been weaker than any comparable period since the Great Depression. Given these results under the last two Democratic administrations, it should not be surprising that the Sanders program—aiming to break emphatically with the neoliberal framework that has dominated economic policy since Reagan—has caught fire among large segments of Democratic and independent voters. Nevertheless, might it still be true, as the critics insist, that the Sanders program is based on flimsy foundations and wishful thinking? Do critics really think it’s impossible to devise a healthcare system roughly like those in Germany or France? It is true that raising the federal minimum to $15 an hour by 2020 would entail an increase that is substantially higher than the typical pattern. Nevertheless, businesses will be able to absorb most of the cost increases through modestly raising their prices as well as through cost savings, since worker turnover and absenteeism will fall when job conditions improve. A recent study by Wicks-Lim and myself found that, even fast-food restaurants, which employ a disproportionate share of minimum wage workers, are likely to see their overall business costs rise by only about 3.4 percent per year during a four-year phase-in for a $15 minimum wage. This means, for example, that McDonalds could cover fully half of the cost increase by raising the price of a Big Mac, on average, by about 15 cents per year for four years—from $4.90 to $5.50. This Wall Street tax can be used to address two distinct but equally important concerns. First, it discourages financial market speculation because it raises the costs—and thus reduces the profit opportunities—for speculators. But assuming the tax rate is not set high enough to shut down trading altogether, the tax can also be a large new source of government revenues. Overall, the Sanders program is capable of raising living standards and reducing insecurity for working people and the poor, expanding higher educational opportunities, and reversing the decades-long trend toward rising inequality. It could bring Wall Street’s dominance under control and help prevent a repeat of the financial crisis. It will also strongly support investments in education, clean energy, and public infrastructure, generating millions of good jobs in the process. Robert PollinRobert Pollin is a Distinguished Professor of Economics and co-director of the Political Economy Research Institute at the University of Massachusetts–Amherst.